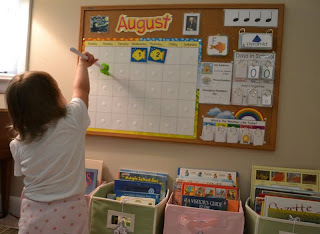 I've recently been inspired by Mama Jenn, Confessions of a Homeschooler, and 1+1+1=1 to start Calendar Time. A friend told me about it at a meeting a few days ago, and I had to immediately come home and look it up; I was amazed at the learning potential! So, I decided to tweak a few things to meet the needs of our family (because there is no one-right-way to do Calendar Time; in fact, if there's a wrong way, I'll probably do it that way first! I'm a learn-by-making-my-own-mistakes kind of girl, so the lessons usually stick, but it's a messy, gooey stick that is never really pleasant... Aaaannyway, back to the calendar! ;) ). I did an image search for 'cute frames' and found this free template (and I'm sorry I can't link to it; I've just spent way too much time looking for it again, and I can't seem to find it, but it's out there somewhere). I found some images I liked, then I went into Photoshop and customized my new labels. After that I used decorative trim from a craft store to make the purple bows. For the finishing touches, as in, that cute little bow will never, ever come untied, I used (lots of) super glue to hold it all together. Now, back to the calendar! You know that the most important thing in a really great calendar set-up is a super-cute little one who's not afraid to use her new pointer! 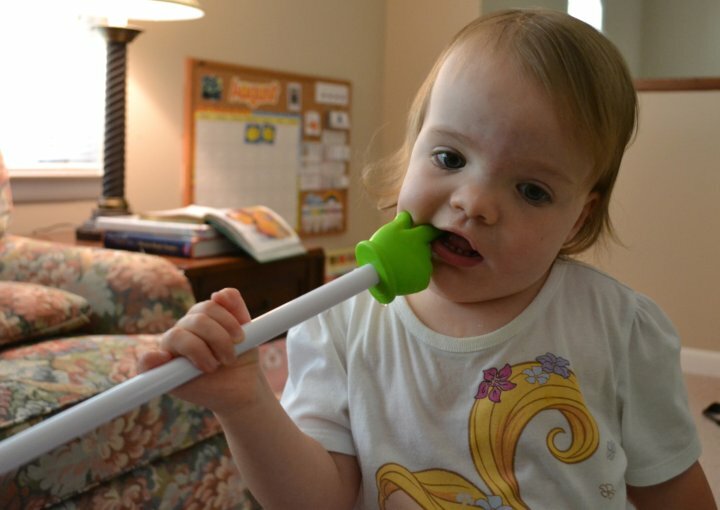 I picked up a cute cartoon hand pointer for each girl, but I'm going to have to go back to the local teacher shop to get one for myself - they're just too fun! Above is a close-up of the right side of my board. 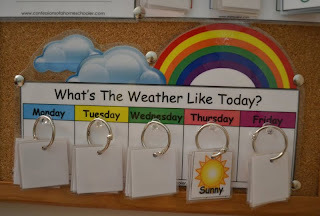 I got the Days in School and the shape flashcards from Mama Jenn (if you've never been to her site, go there right now; she's awesome! ); most of my calendar is copied from hers. 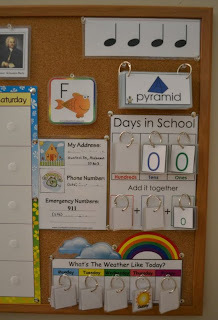 My Address and Important Numbers is from Confessions of a Homeschooler (another one of my absolute favorite bloggers!) 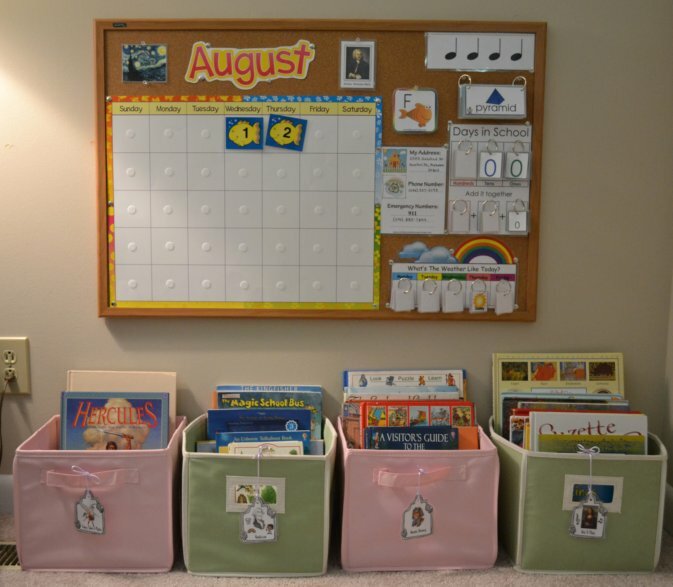 We're going to start COAH's Letter of the Week curriculum on Monday (which will be our first official day of school! 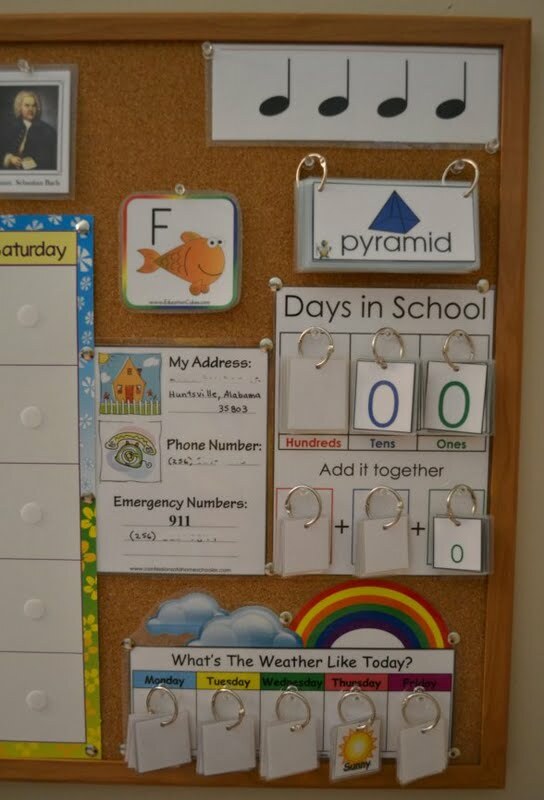 ), so I have our first letter up on the board (the letter printable is from Education Cubes, which we adore). We're going through Handwriting Without Tears with Mary (PreK), so we're doing the letters in the order that book recommends. 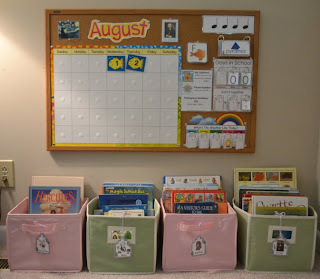 (If you want a sneak peak as to what's in COAH's Letter of the Week curriculum, check out these activities for letter F - sooo great!) I also pinned up a rhythm flash card, and this morning we clapped the rhythm and talked about quarter notes. We had absolutely NO weather here in the South this past Monday through Wednesday! Juuust kiddin'... remember that today was our very first day with the board, so this is all we have up so far for weather. I got this from Confessions of a Homeschooler, and I used Mama Jenn's idea of the rings, which Mary thinks is really fun. Music and Art are big priorities to us (well, music probably more than art, but both are great, right), so I wanted to add some Fine Arts components to our daily Calendar Time. 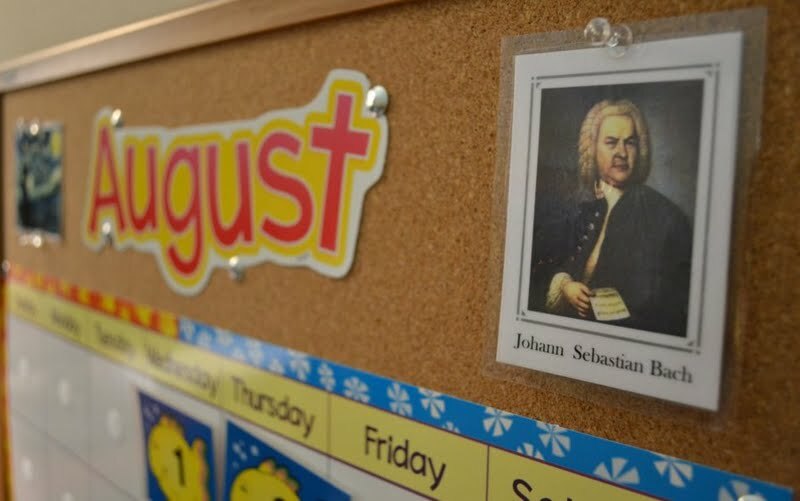 We're trying to learn about one famous composer a month, so we have Bach up on the board for August (poor guy was last month's composer, too, but we didn't really spend a lot of time on him, so he's back - or should I say bach... groan, I know). I got these composer cards from Layton Music, which is a wonderful resource for music review games. 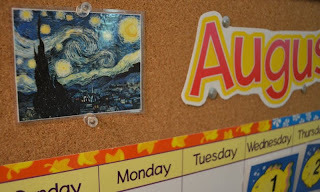 I also wanted to focus on a famous painting (maybe every week, not sure yet), so I just did an image search for Starry Night. We already have a great children's book on Van Gogh, so we'll read that every now and then after looking at the picture.